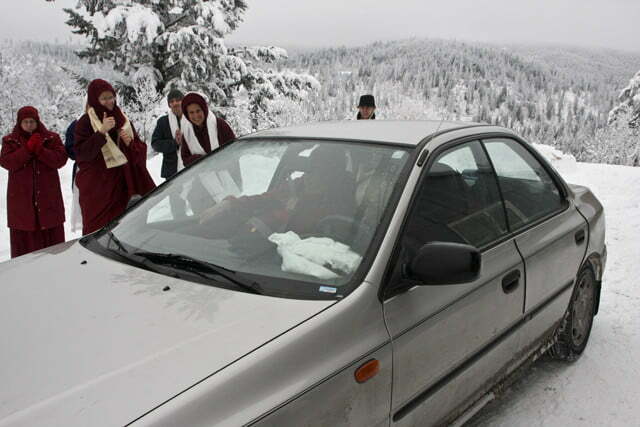 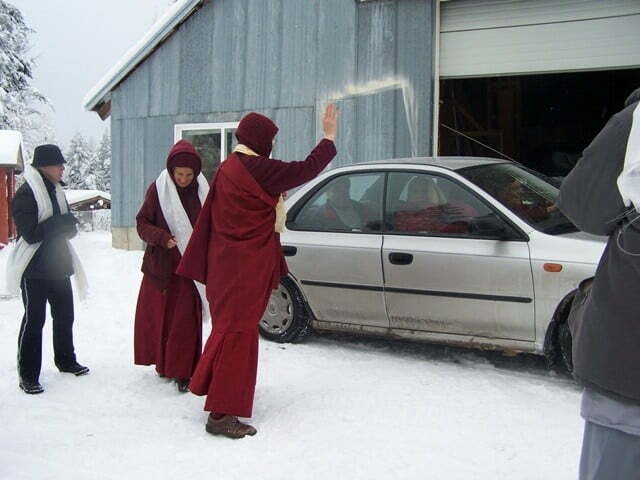 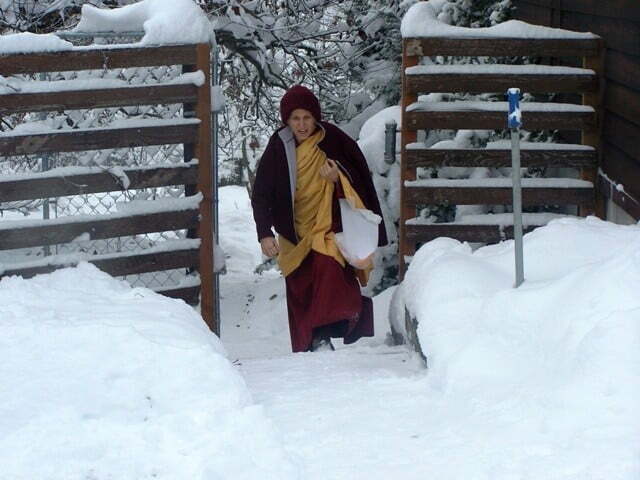 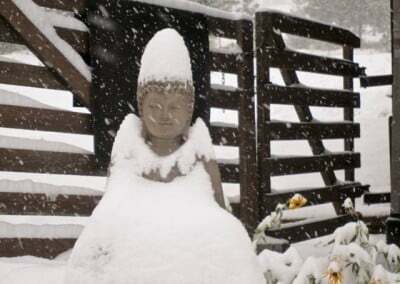 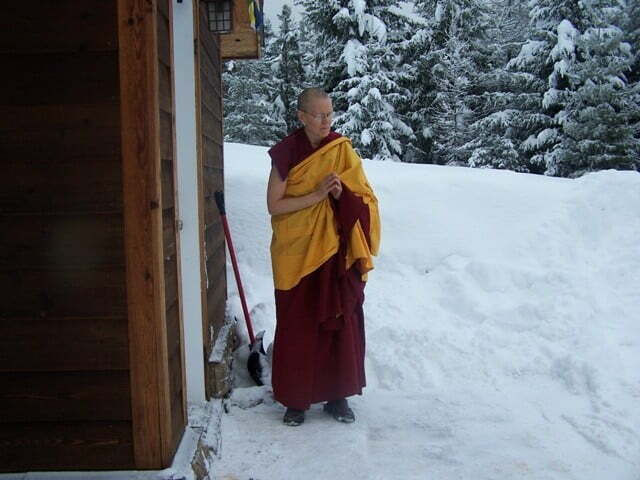 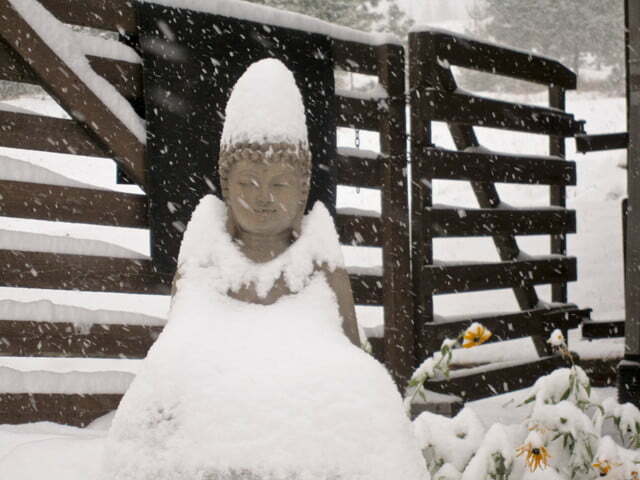 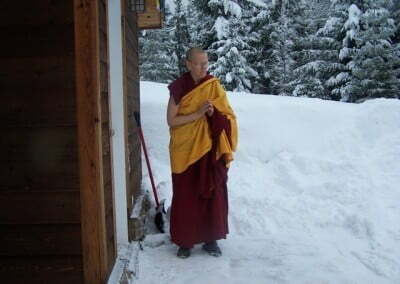 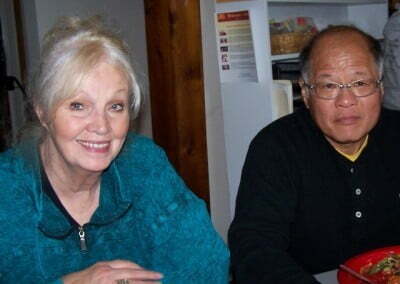 The first big winter storm greeted Khensur Wangdak when he arrived at the Abbey to continue teaching Santideva’s A Guide to a Bodhisattva’s Way of Life . 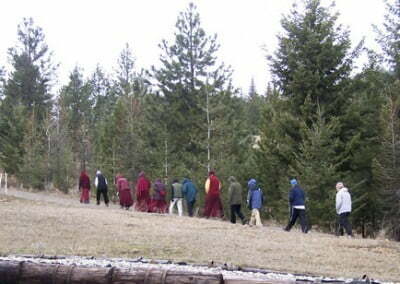 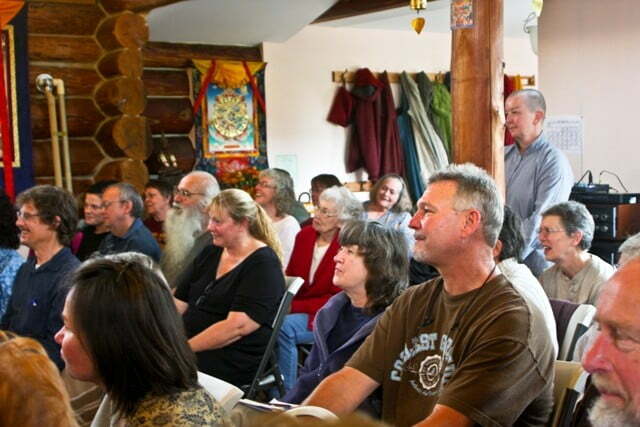 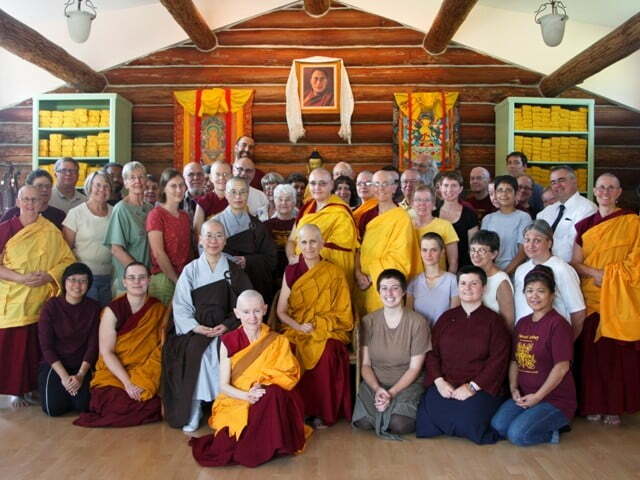 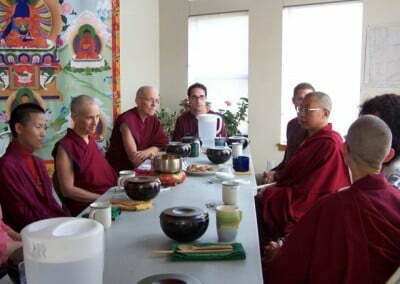 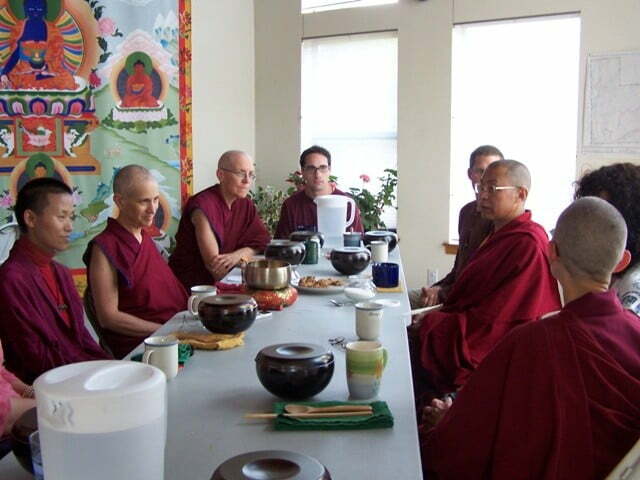 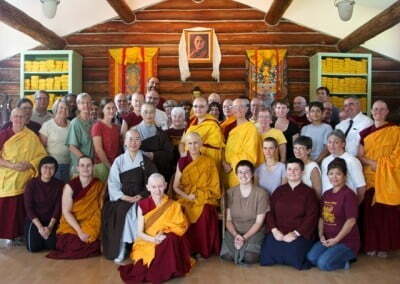 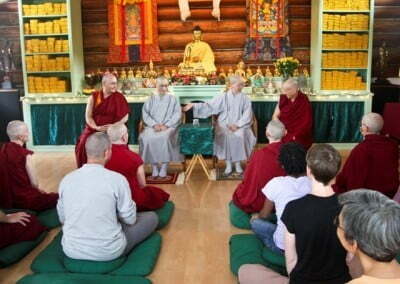 Thirty–two participants, including the community, cherished the warmth and wisdom of Rinpoche’s detailed explanation of the four opponent powers for purification. 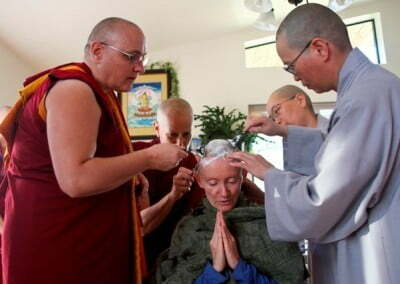 He also gave the White Tara initiation. 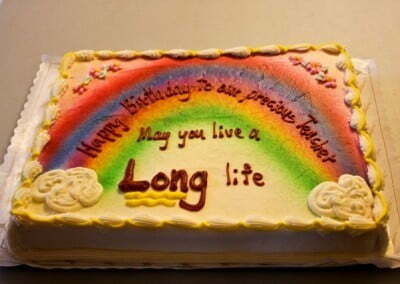 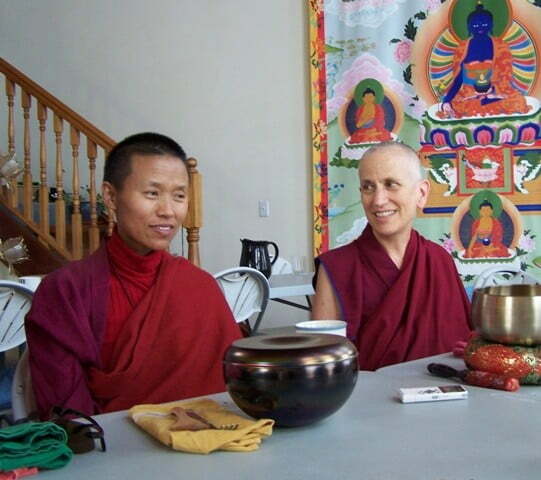 With deep gratitude, we have joyfully requested that Khensur Wangdak return soon. 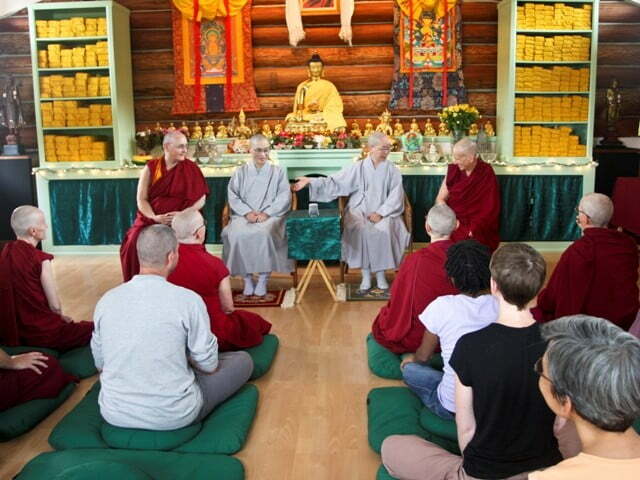 Although rain and wind kept the 75 friends and Abbey community indoors most of the day, September 19 was filled with vast blue skies of merit, joy and appreciation. 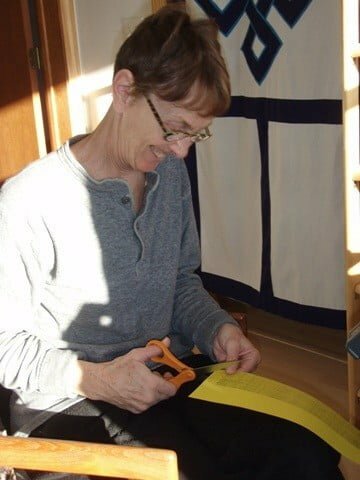 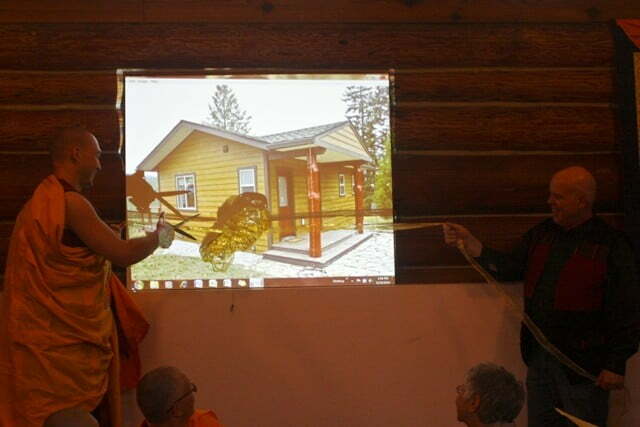 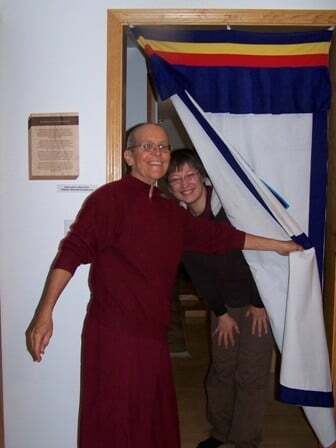 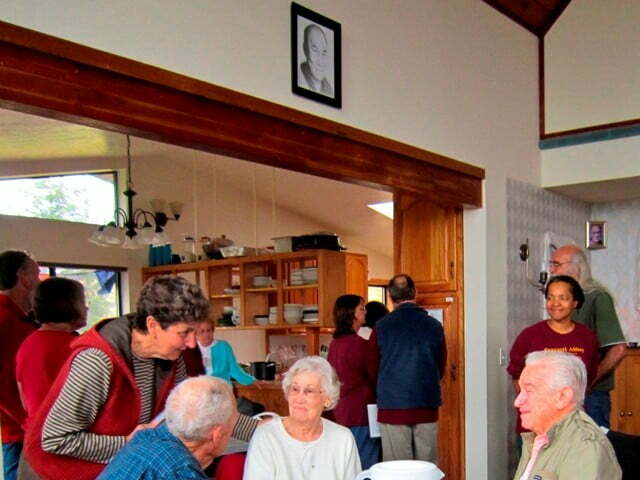 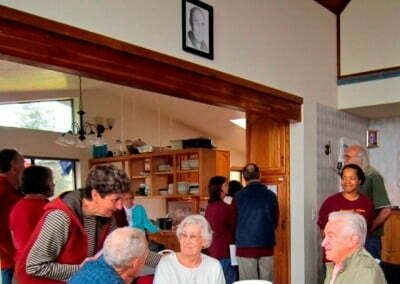 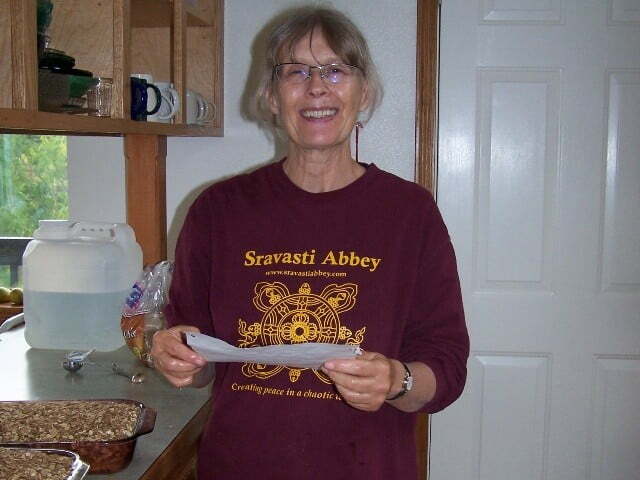 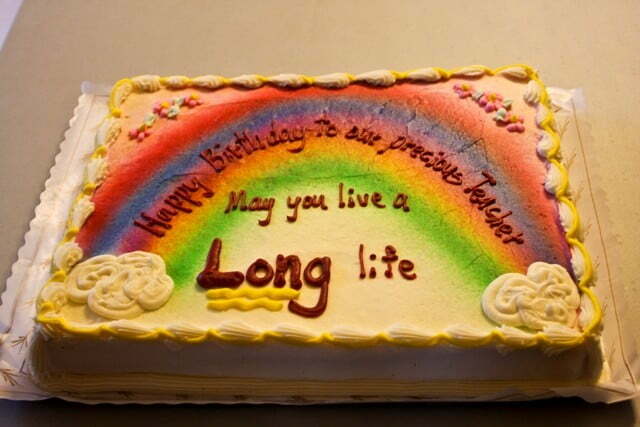 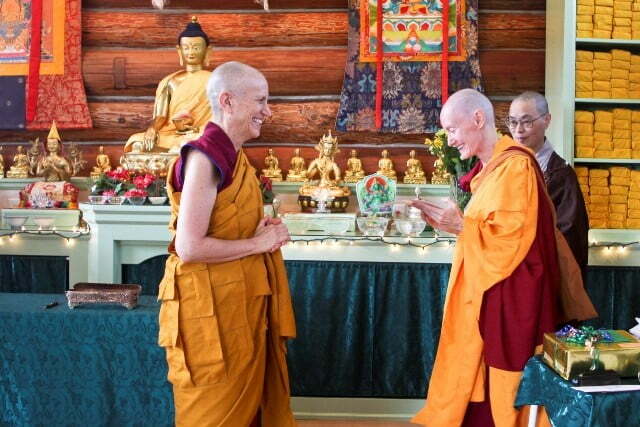 There were many reasons to smile: a long life puja to celebrate Venerable Chodron’s 60th birthday, consecration of the retreat/guest teacher’s cabin, and the culmination of the first big phase of the Abbey’s master plan. 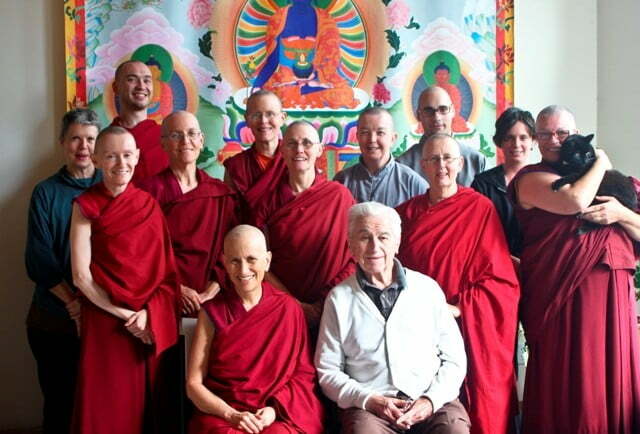 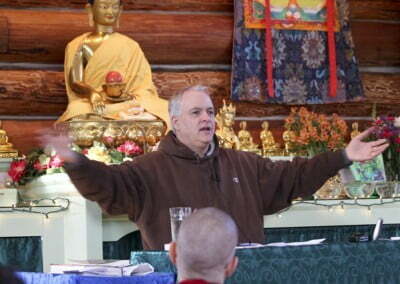 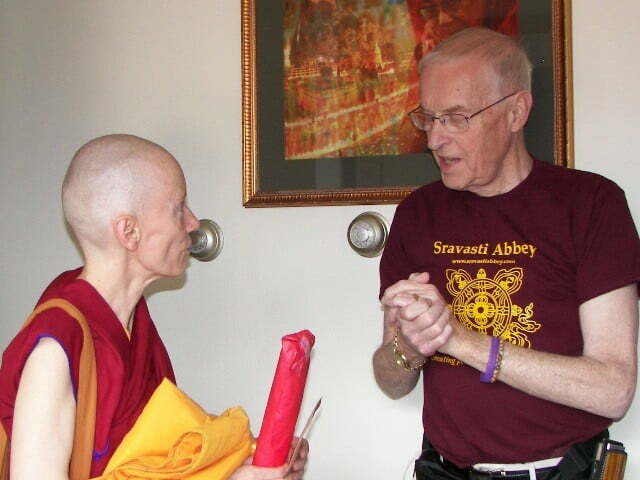 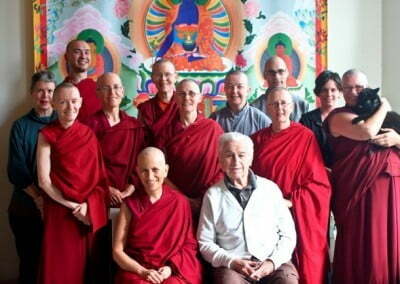 Venerable Chodron’s dad, Bernie Greene, made his first trip to the Abbey for the occasion. 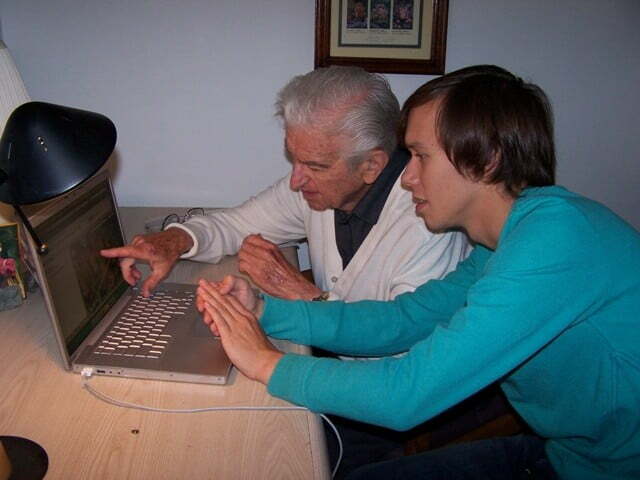 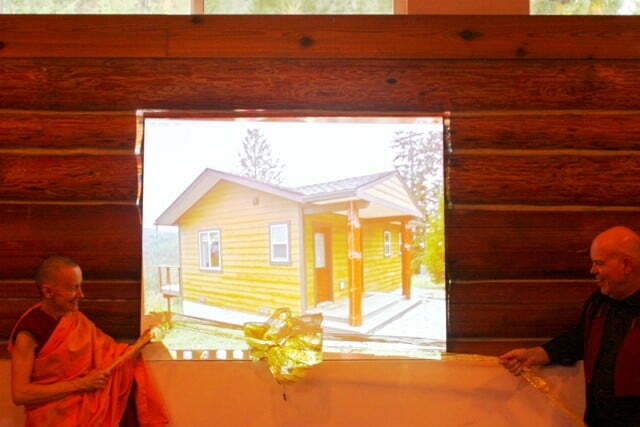 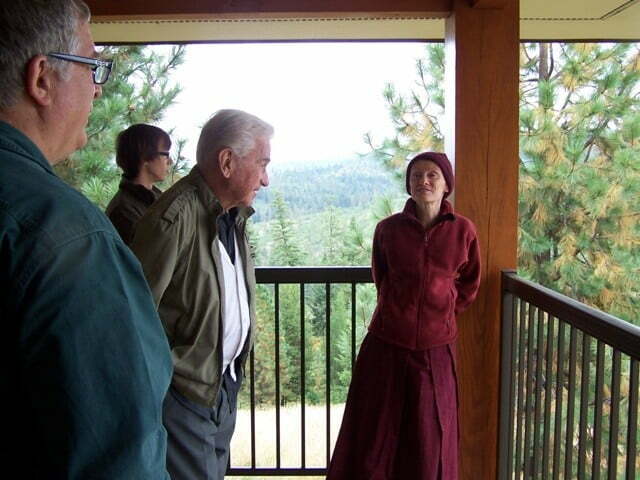 He had a wonderful time meeting everyone and getting a grand tour of the buildings and forest. 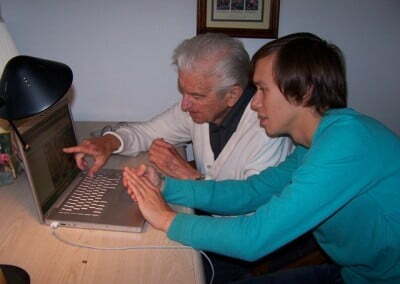 He promises to return in the near future. 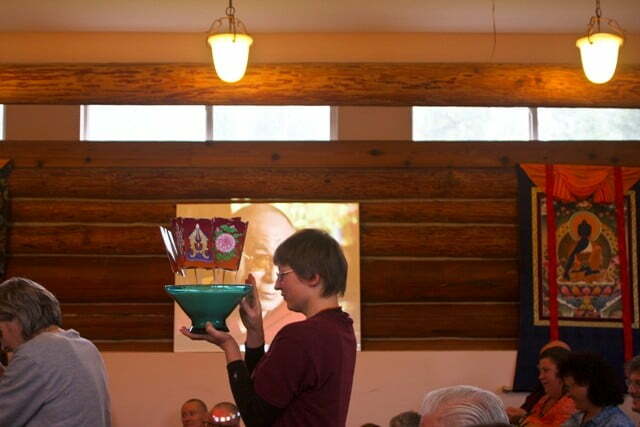 A big thank you and bow to all of our friends who helped make the day a huge success. 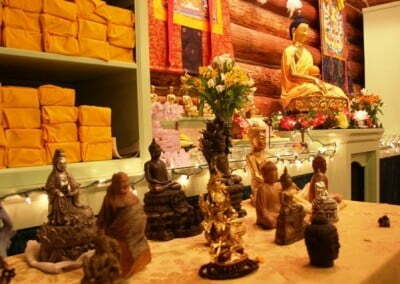 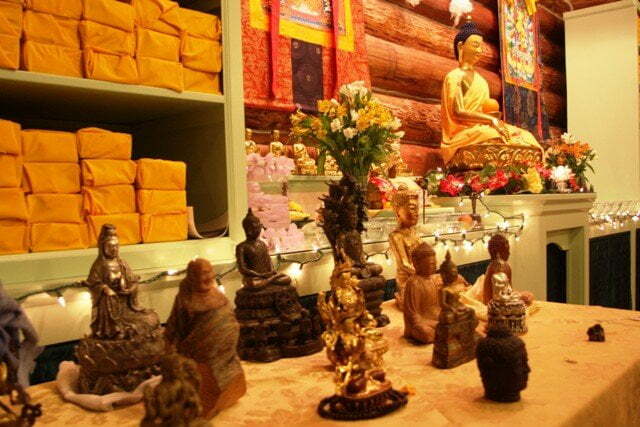 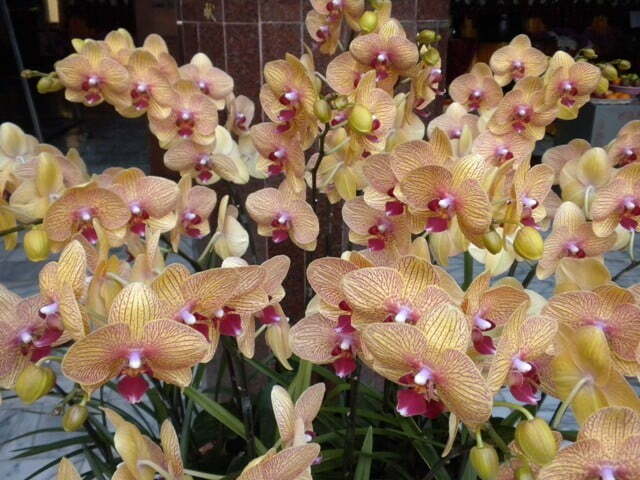 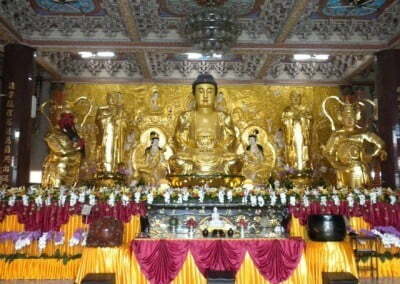 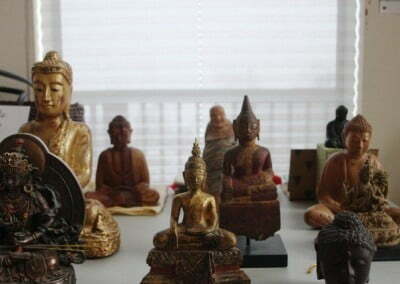 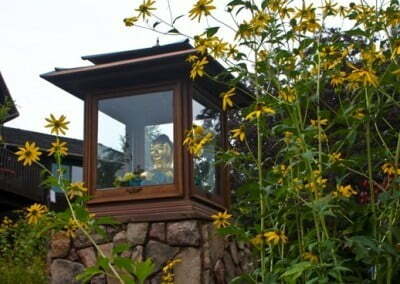 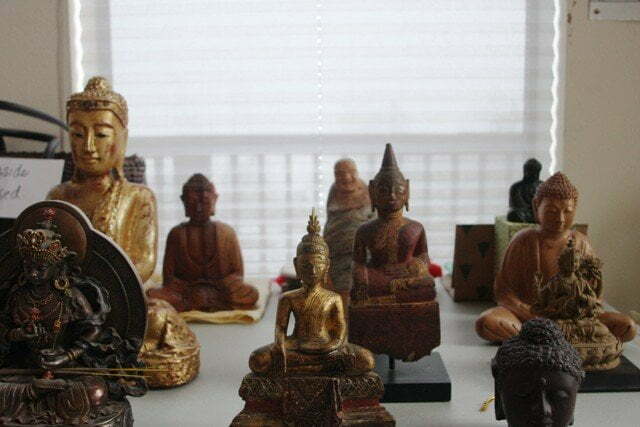 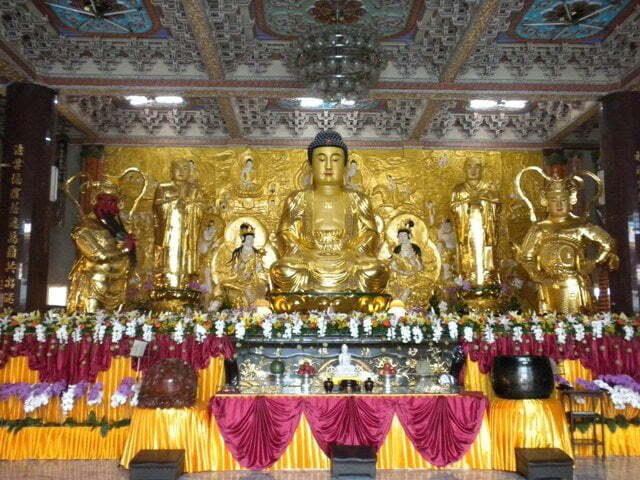 May the Buddhas bless all of you for your great kindness! 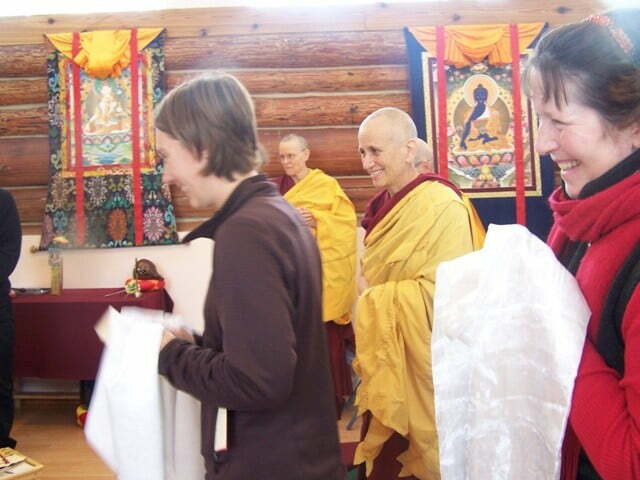 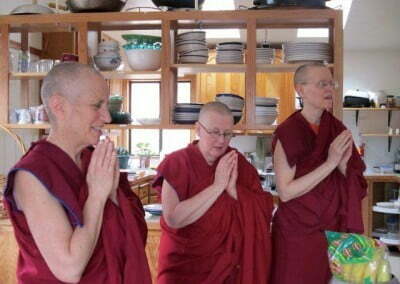 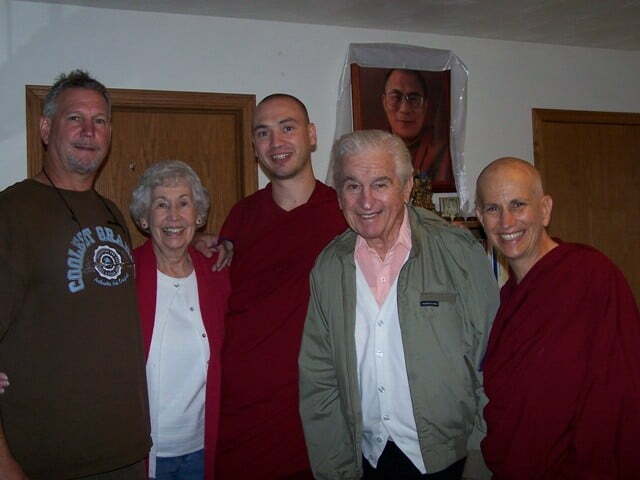 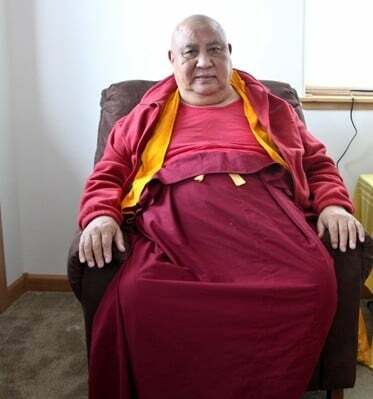 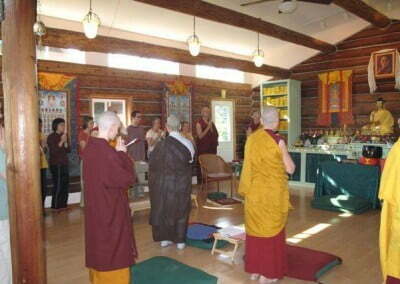 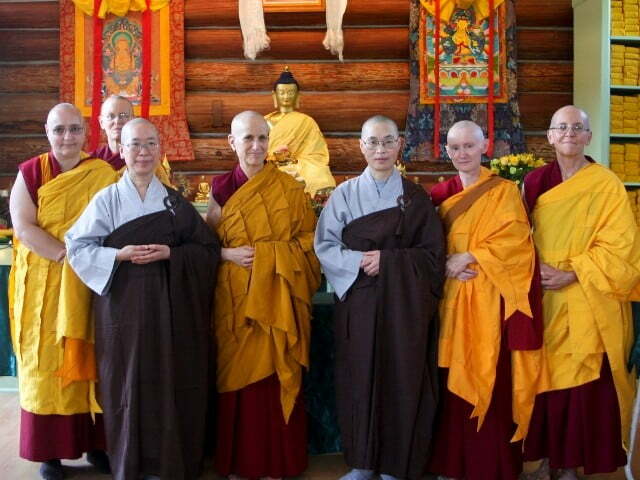 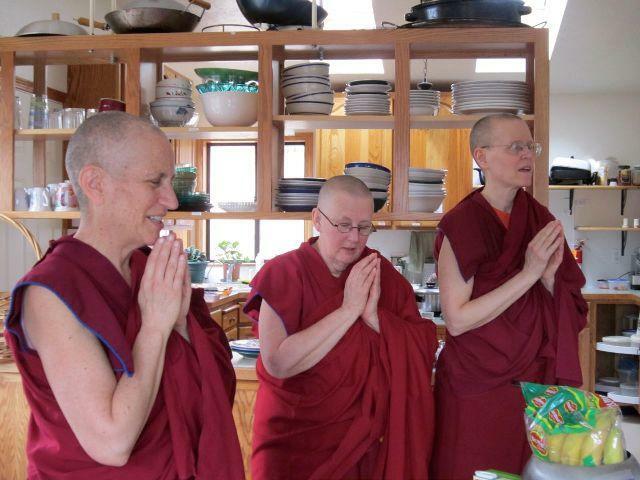 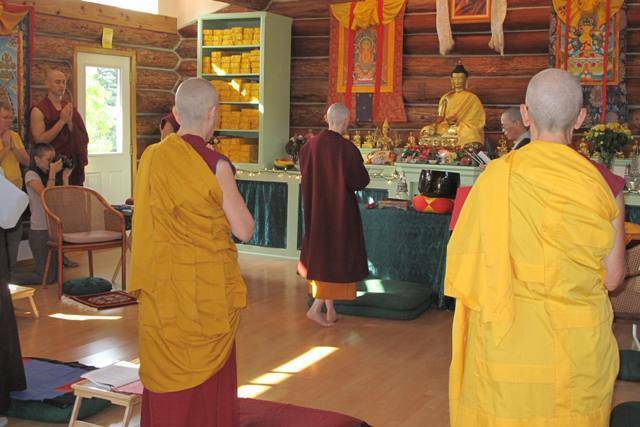 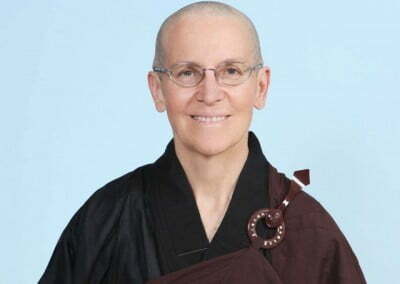 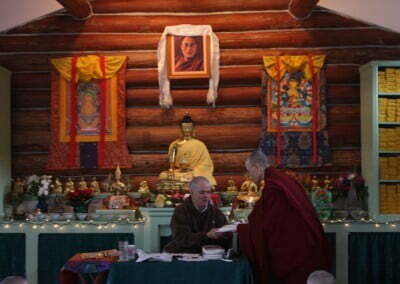 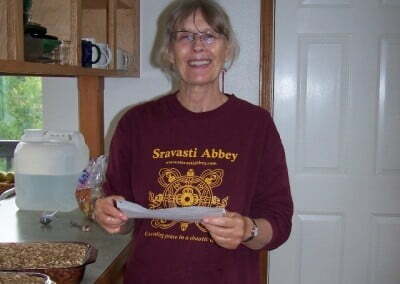 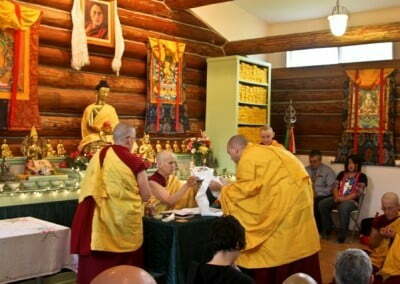 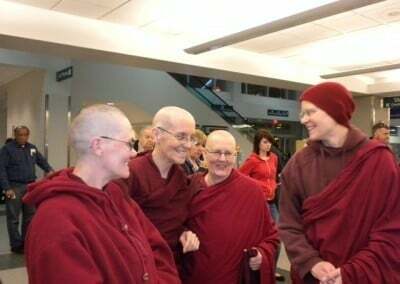 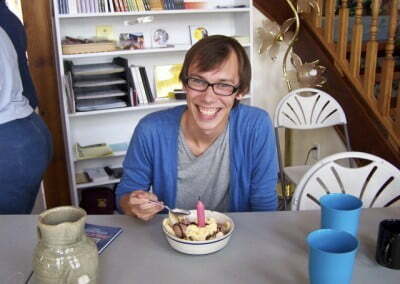 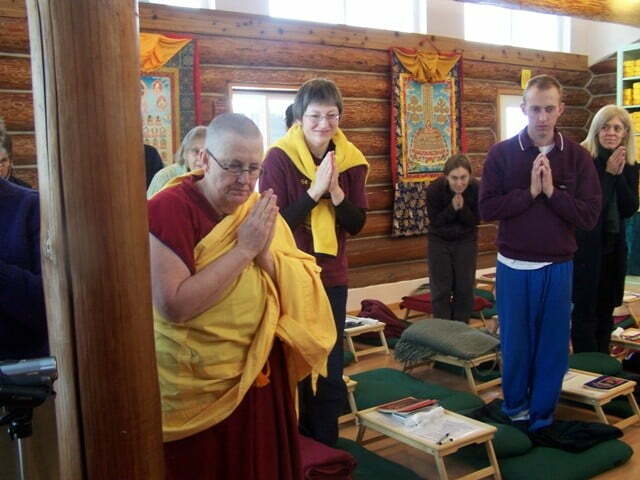 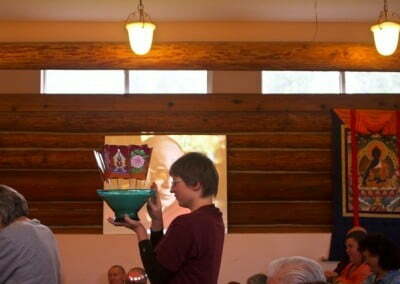 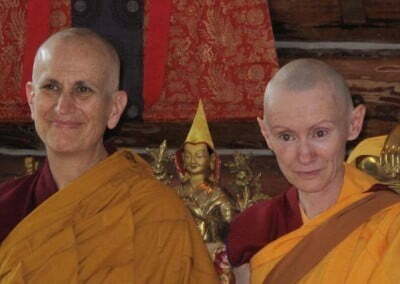 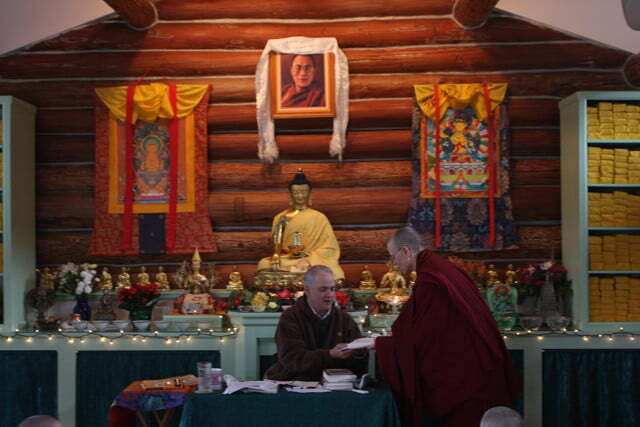 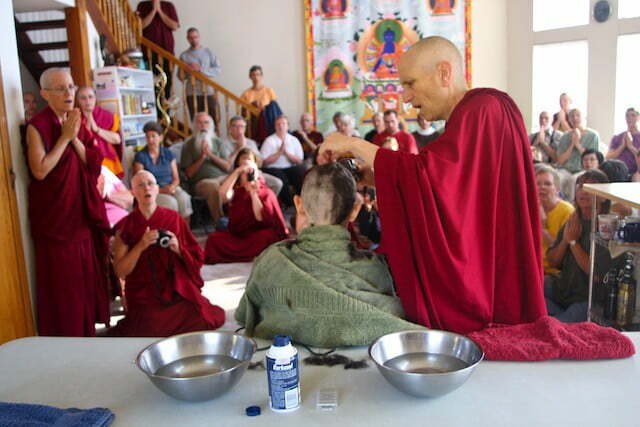 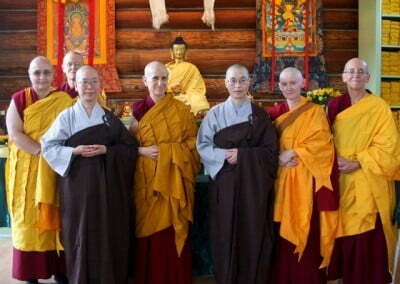 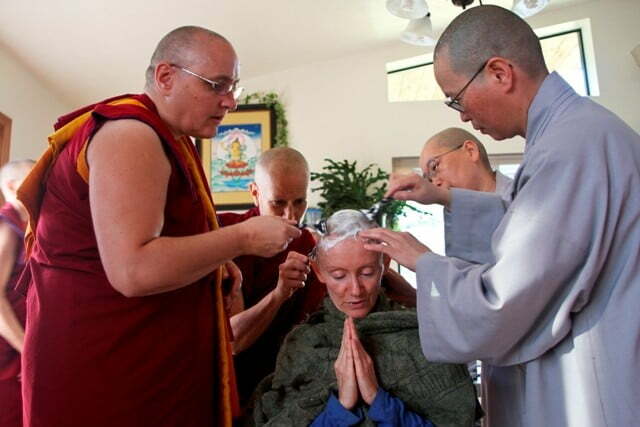 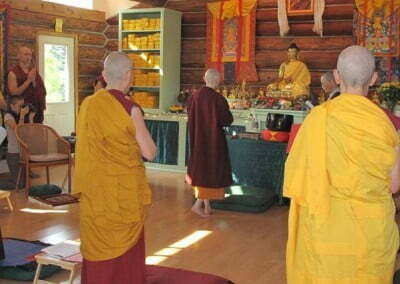 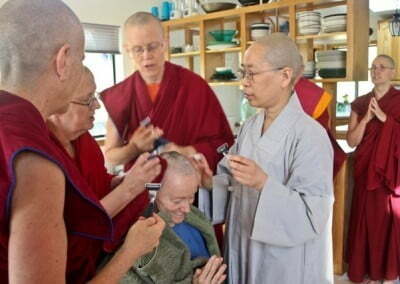 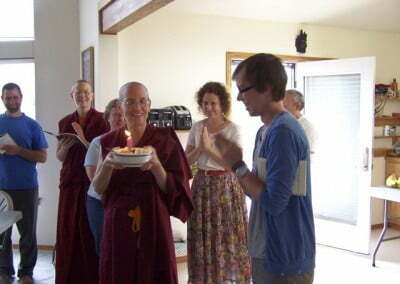 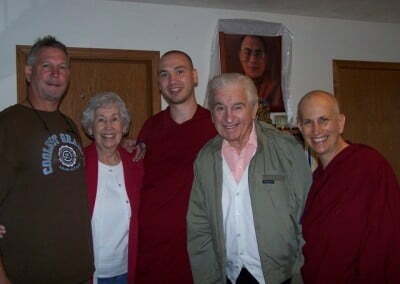 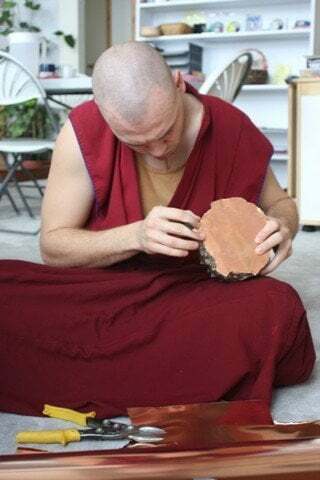 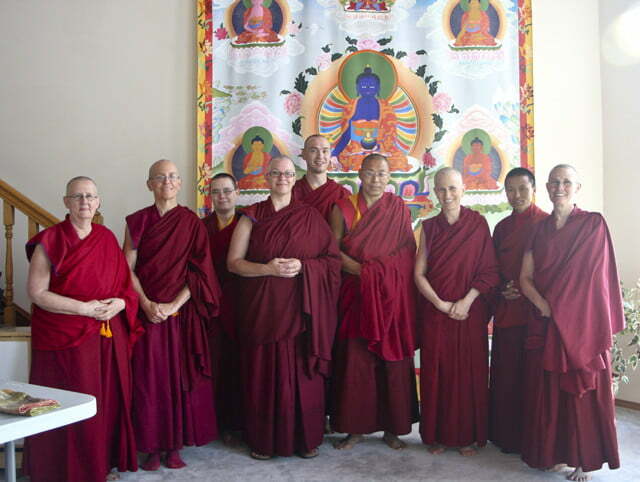 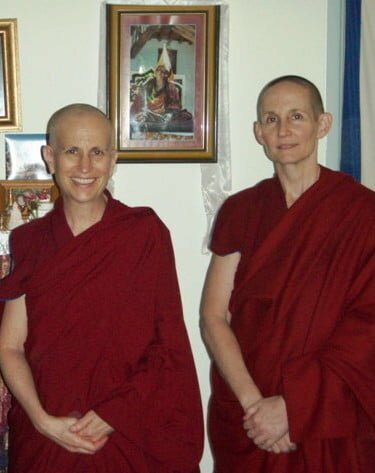 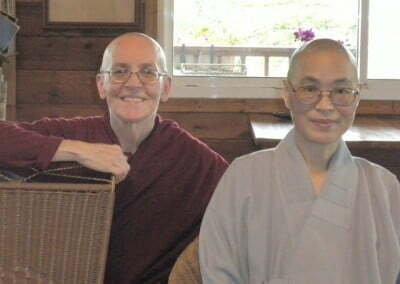 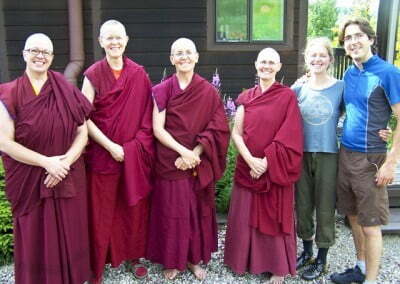 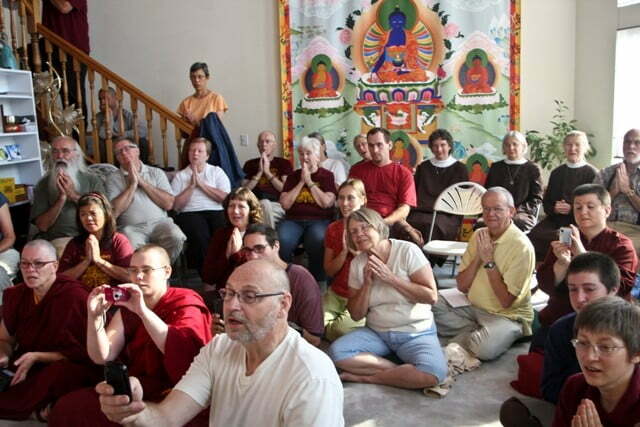 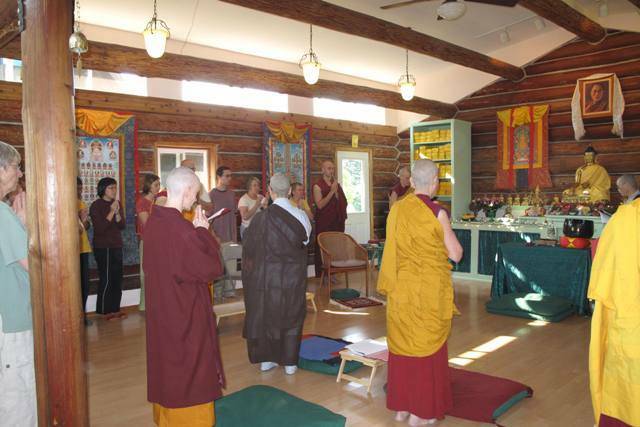 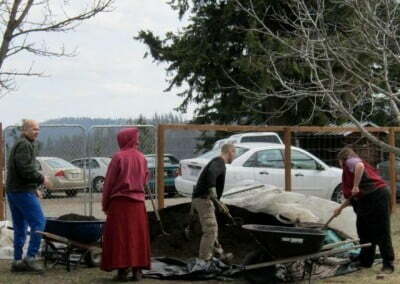 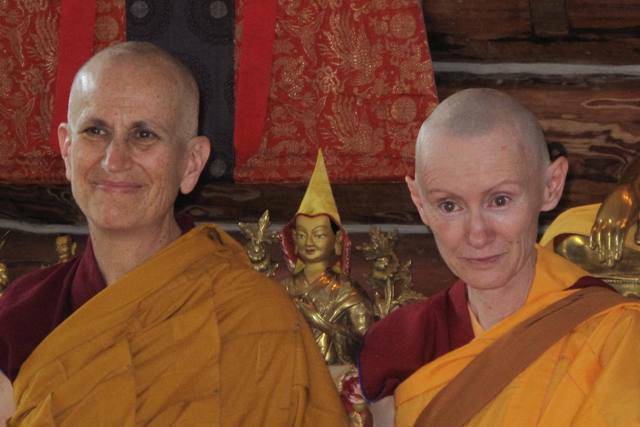 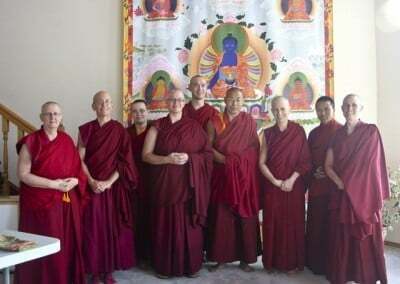 Dallas Becker, one of Sravasti Abbey’s full time residents and a long time student of Venerable Chodron, took novice vows on August 26th, becoming Venerable Thubten Samten, the Abbey’s seventh resident monastic. 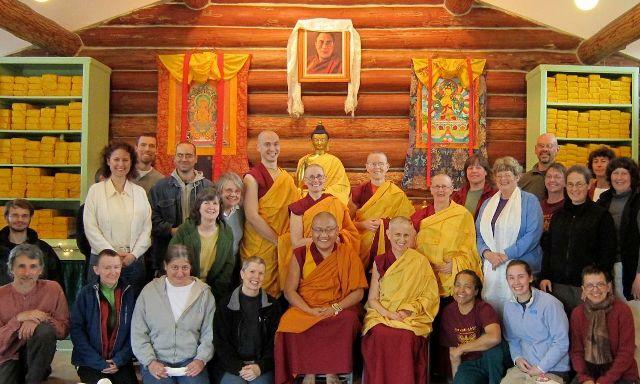 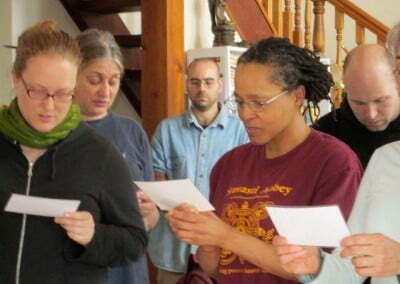 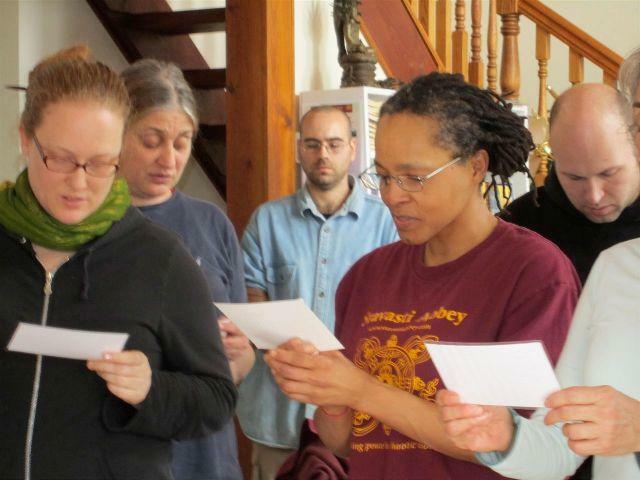 With 50 friends and supporters in attendance, including all the participants in this year’s Exploring Monastic Life program, it was a truly auspicious day. 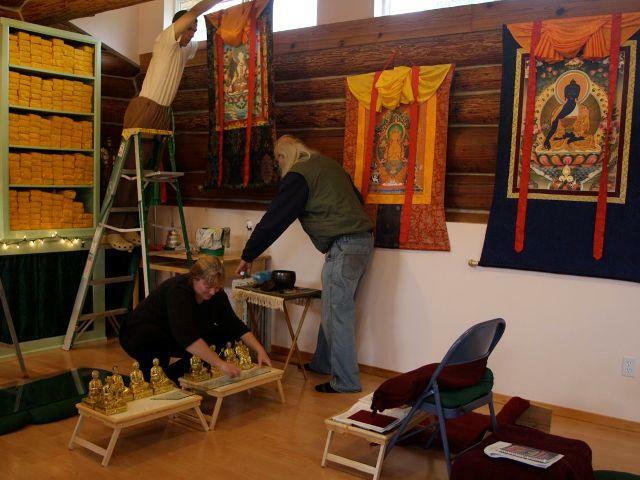 In Arlee, Montana—two mountain passes and a four-hour drive east of us—a community of residents and volunteers is casting beautful Buddha statues to build a Garden of 1000 Buddhas. 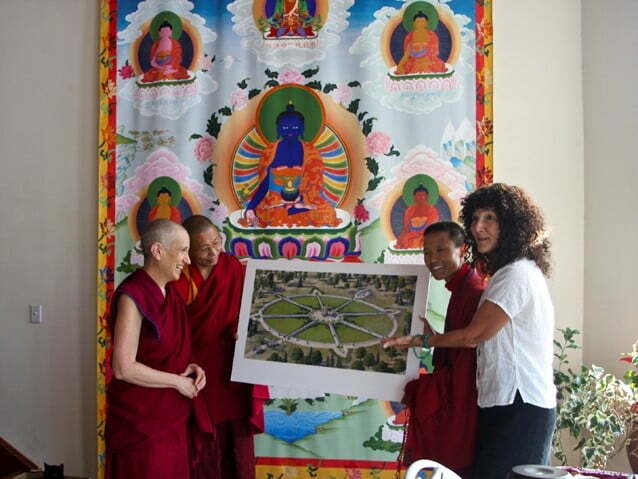 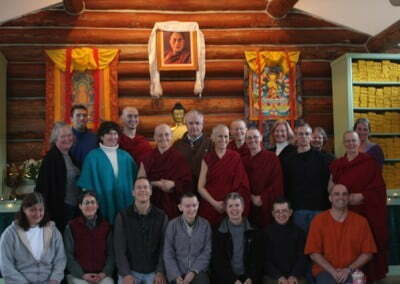 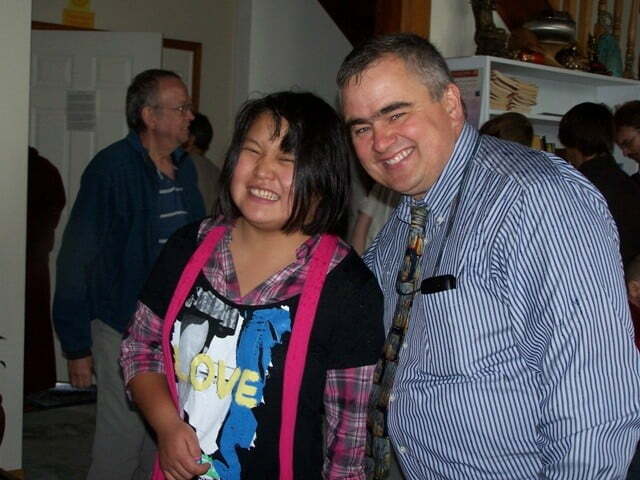 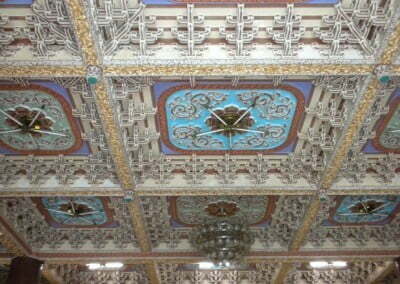 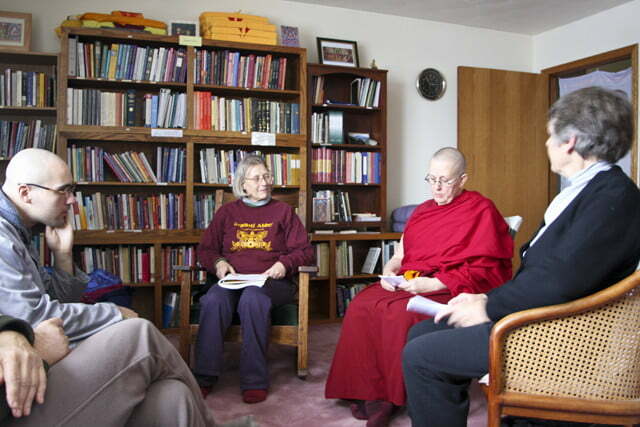 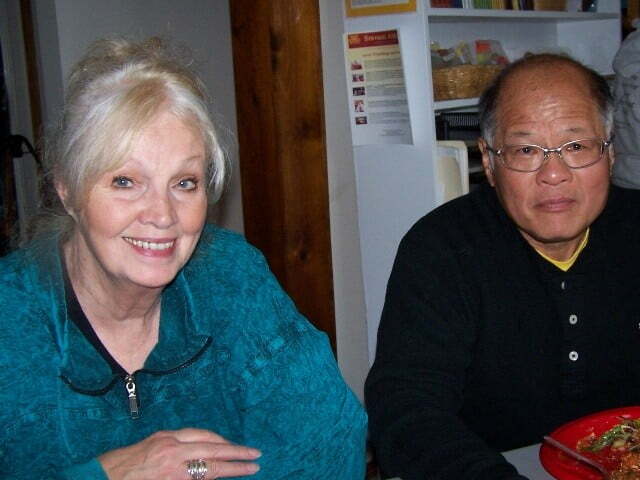 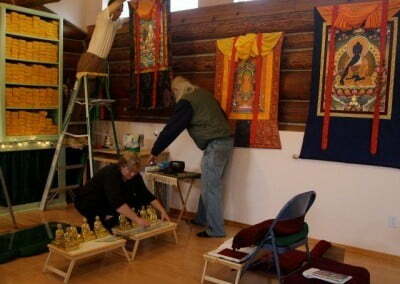 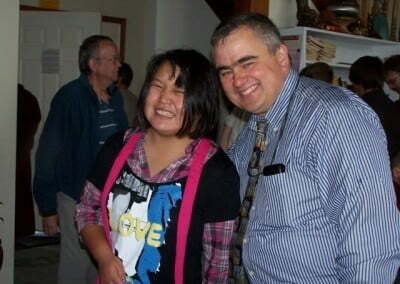 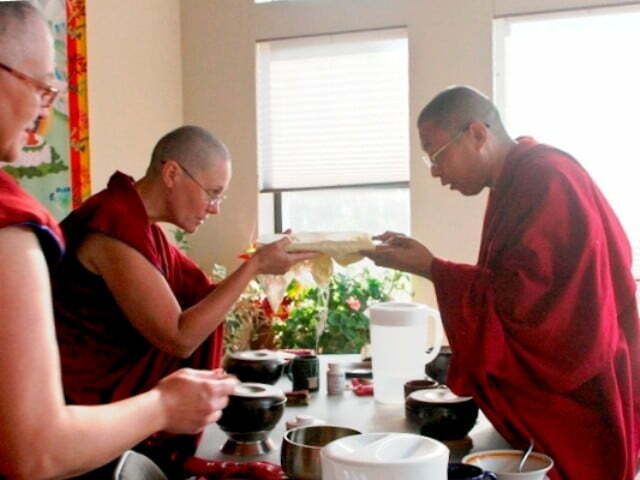 Members of the group, Ewam Sang-ngang Ling, recently paid a neighborly visit to the Abbey. 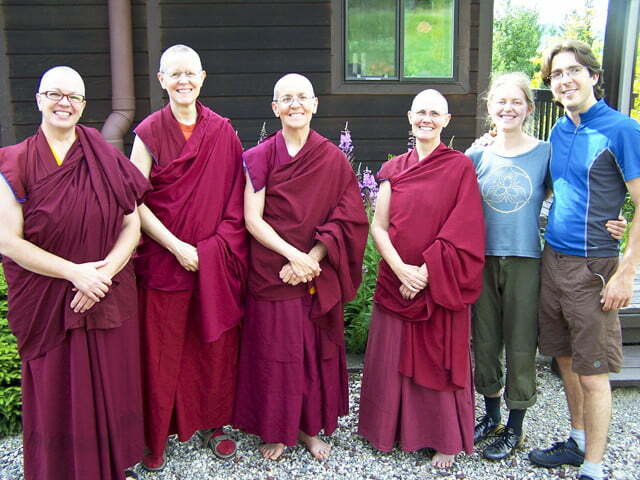 We’re delighted that they paid us a visit. 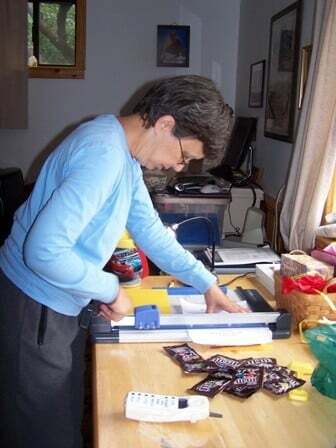 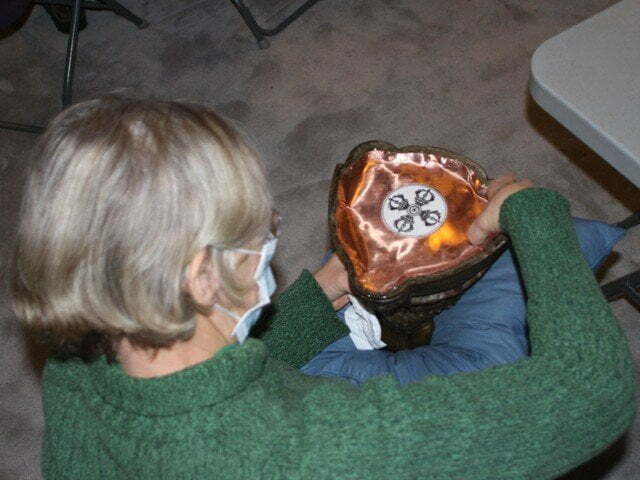 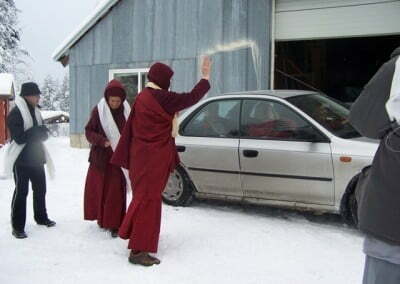 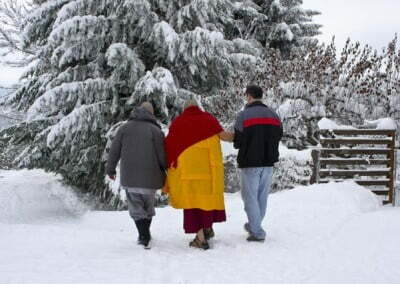 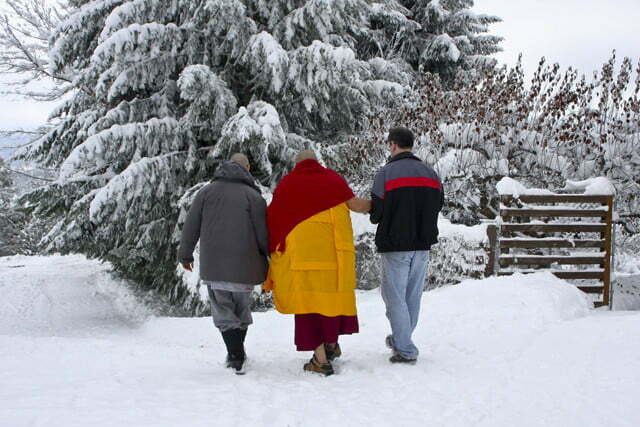 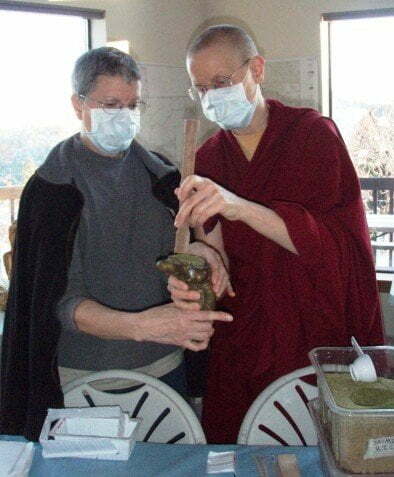 The Abbey monastic community thrives due to the kindness of so many beings. 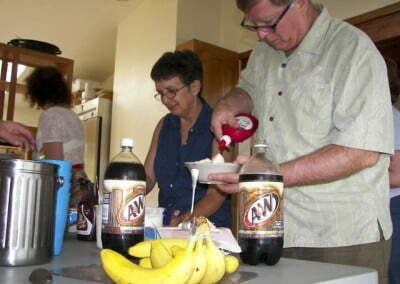 We recently celebrated our gratitude with an ice cream social. 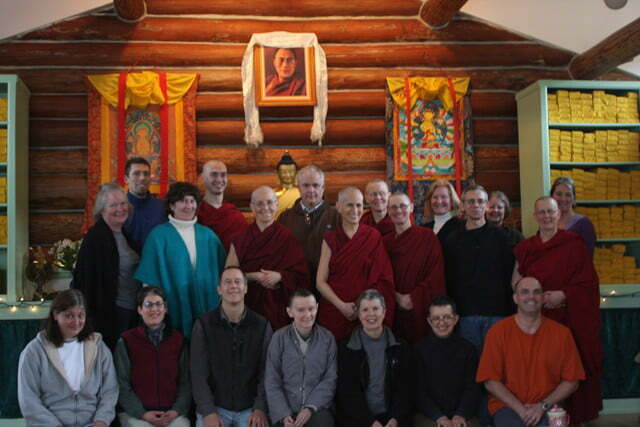 It was great fun to be with so many old and new friends. 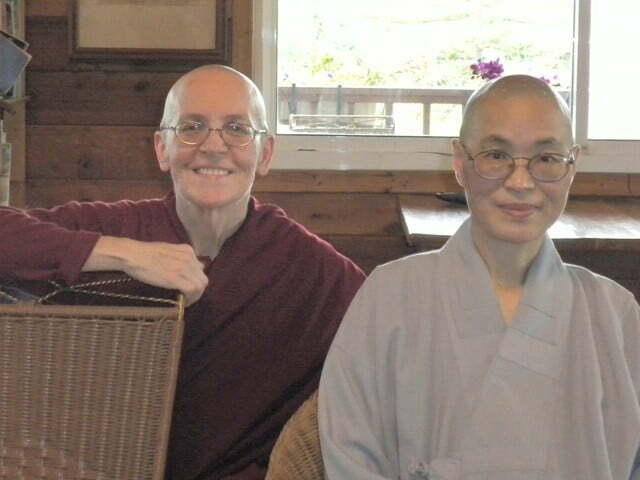 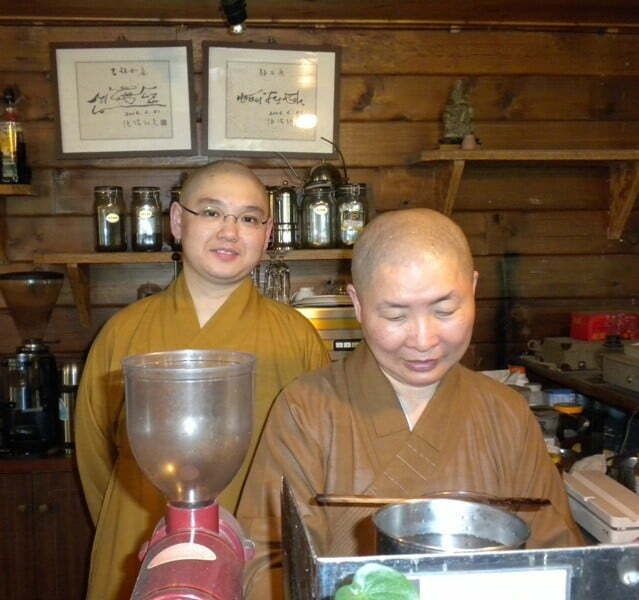 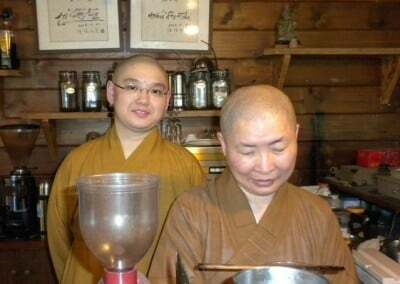 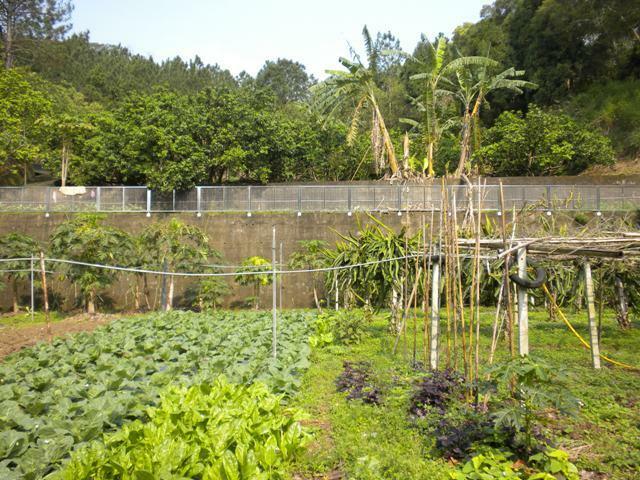 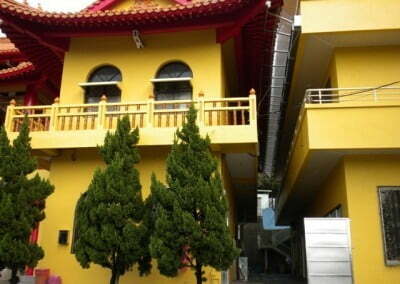 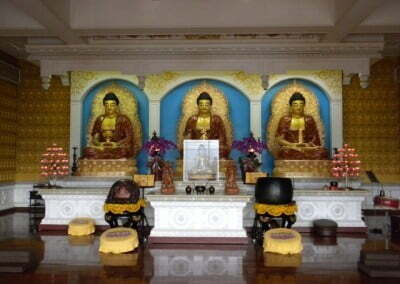 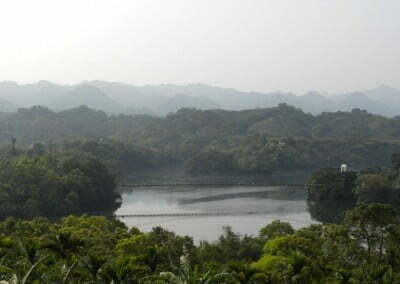 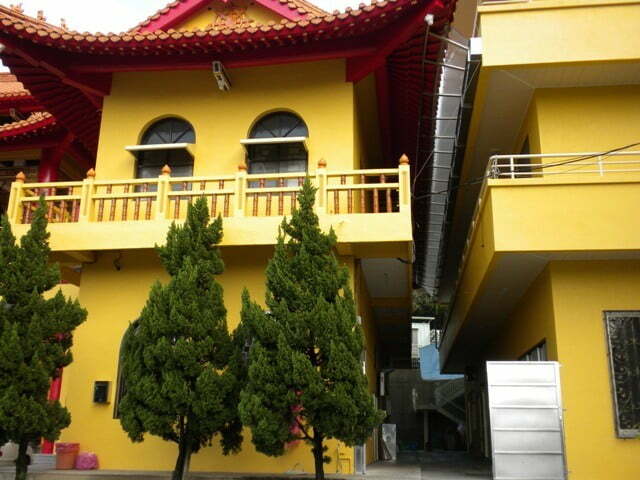 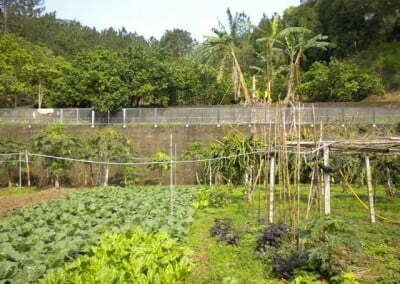 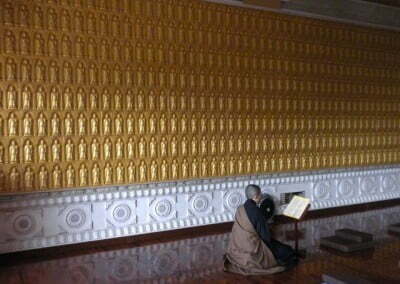 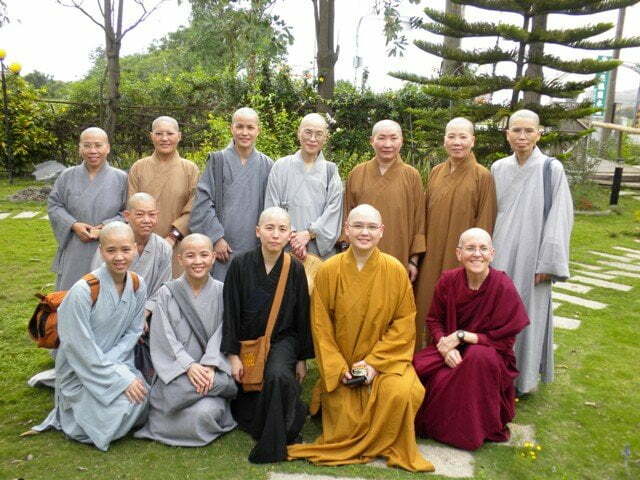 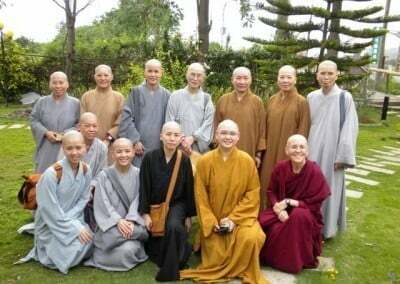 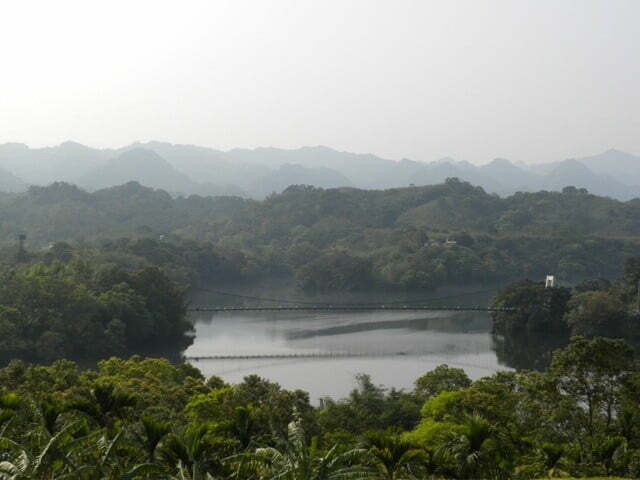 Venerable Semkye has returned from Taiwan where she received bhikshuni ordination, becoming the third fully ordained monastic—after Venerables Chodron and Tarpa—at the Abbey. 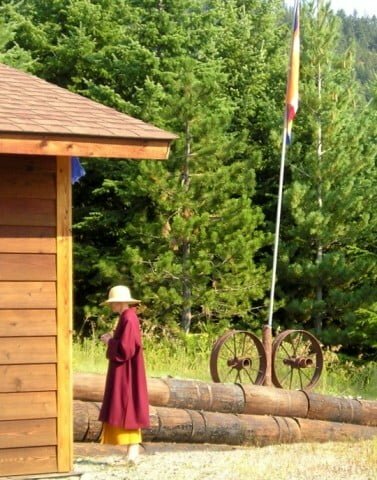 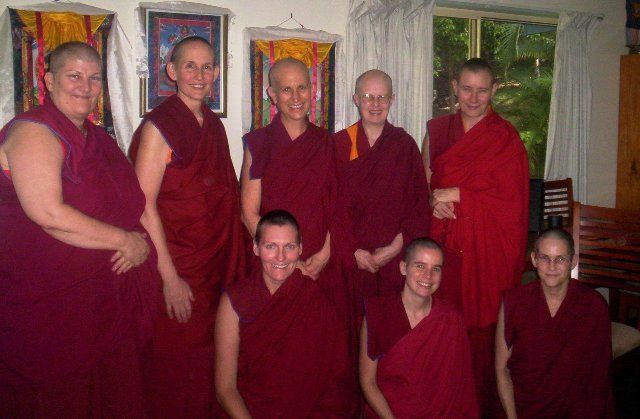 The intense two-month monastic program she attended, along with 259 other monks and nuns, gave her few opportunities to take photos, but this collection gives a good idea of the temples and people she met along the way. 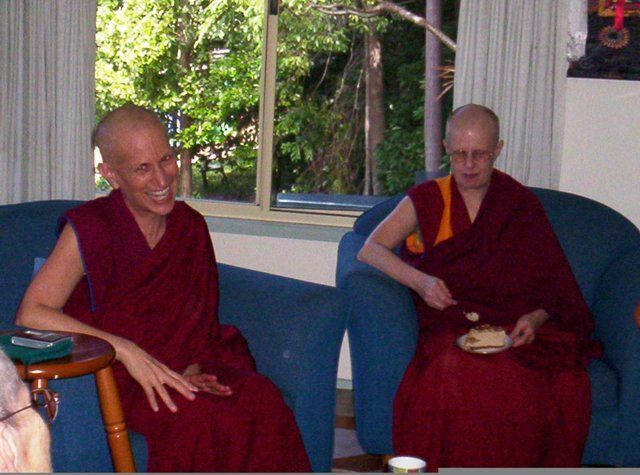 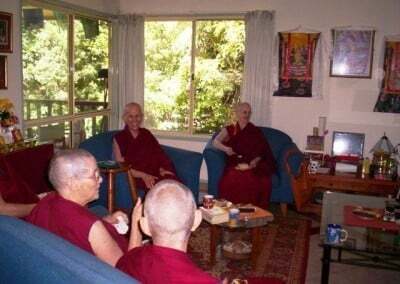 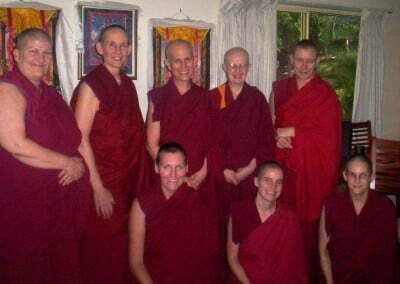 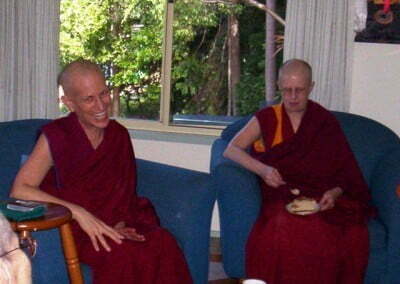 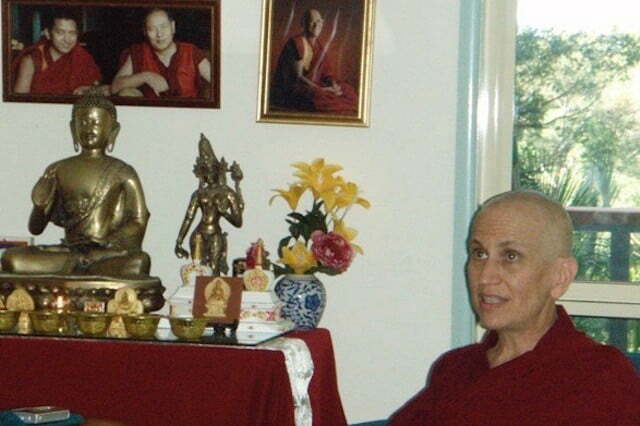 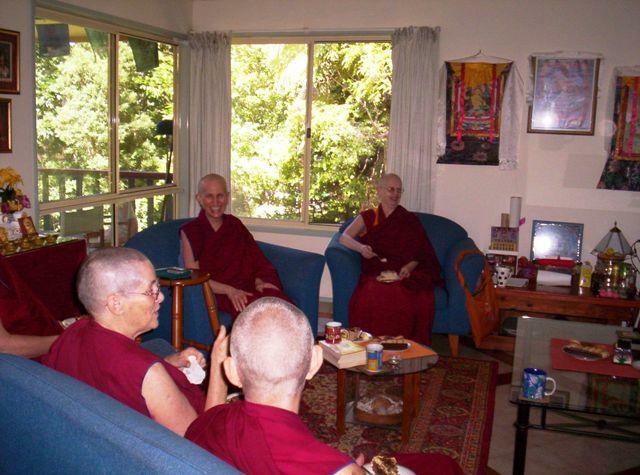 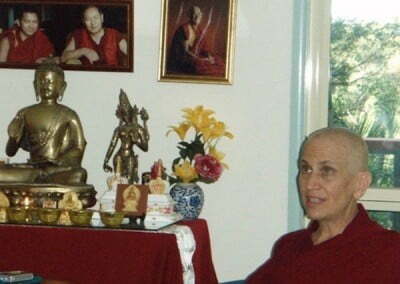 The first stop on Venerable Chodron’s inaugural visit to Australia was Chenrezig Institute (CI) on the Sunshine Coast, where she gave a public talk, a weekend workshop, and met with eight of the 16 nuns that live and study there. 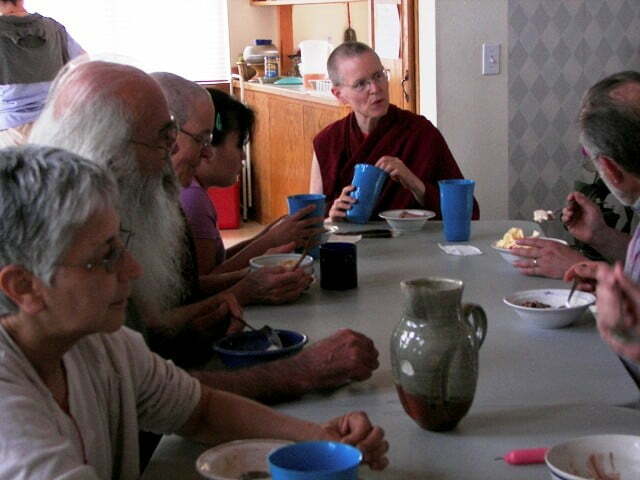 The visit offered a special opportunity to share her wisdom on monastic life and community. 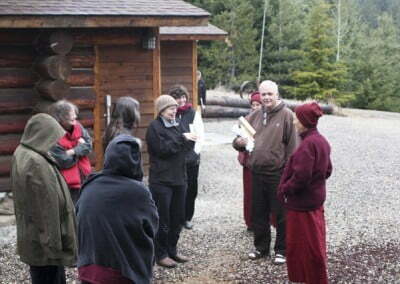 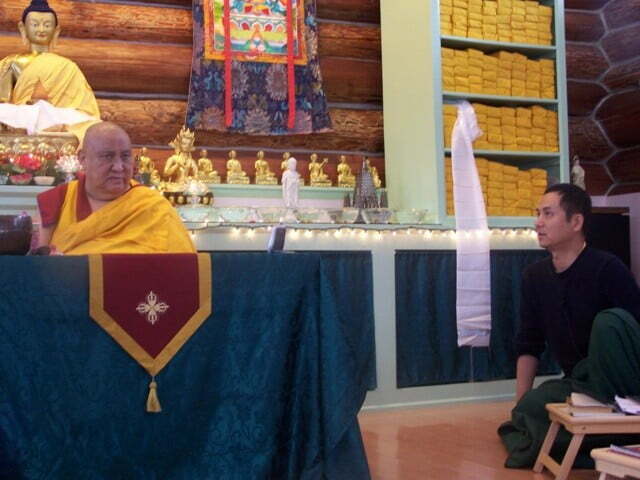 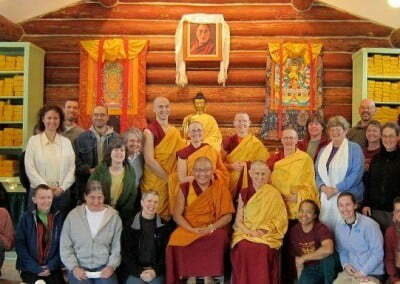 We are always delighted when Geshe Thupten Phelgye can visit the Abbey. 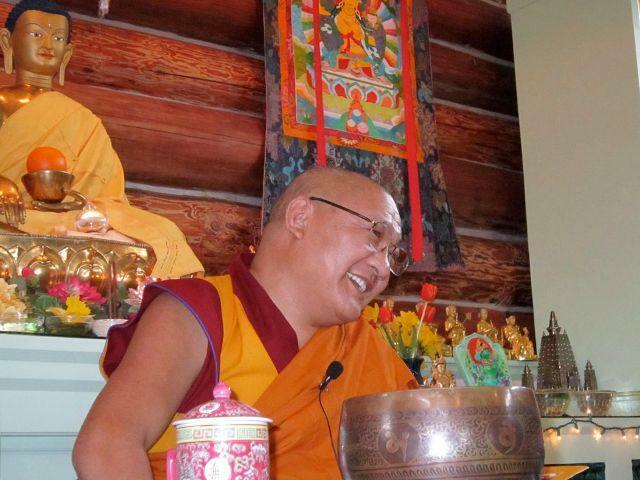 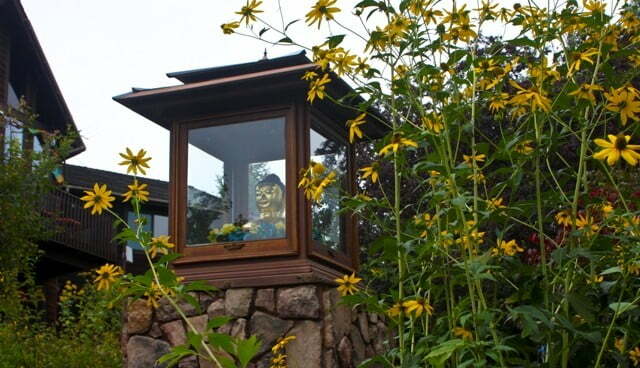 This time he was teaching Lama Tsongkhapa’s “The Foundation of All Good Qualities.” Geshe-la helped us to realize how our thought, “Life is good!” is really an obstacle to our determination to be free. 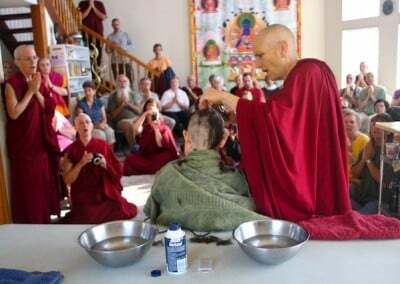 He also asked us to examine which part of the bodhicitta prayer is more meaningful to us: becoming a Buddha or benefiting all sentient beings? 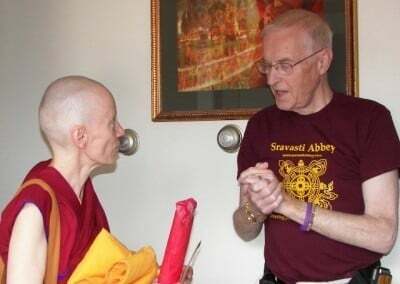 As usual, his practical and heart-felt advice brought everyone more closely in touch with our highest aspirations to serve and benefit sentient beings. 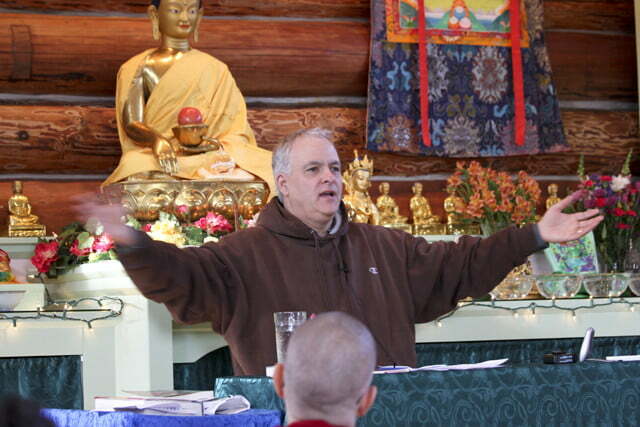 Ever since his days as a young graduate student, Professor Guy Newland has been fascinated with the topic of conventional and ultimate truths in Buddhist philosophy. 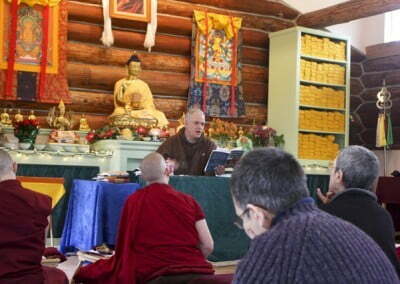 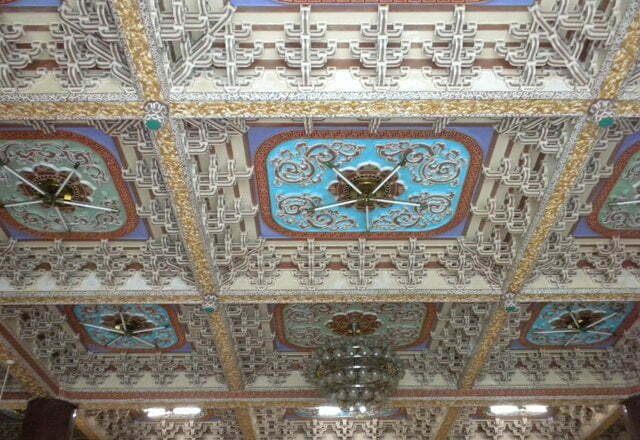 Guy brought his enthusiasm and brilliant scholarship to share with an eager audience at Sravasti Abbey, illuminating the philosophical tenet systems as taught in the Tibetan tradition and inspiring us to deeper study of emptiness and dependent arising as explained by Lama Tsongkhapa. 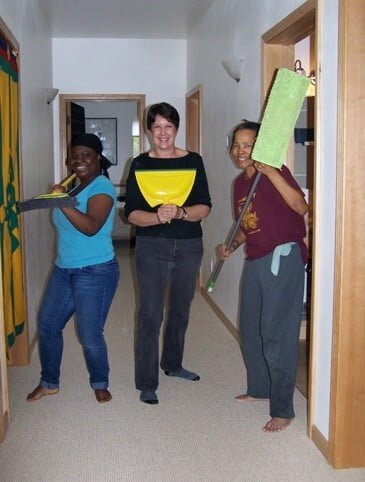 We all worked hard, thought deeply, and had a wonderful time! 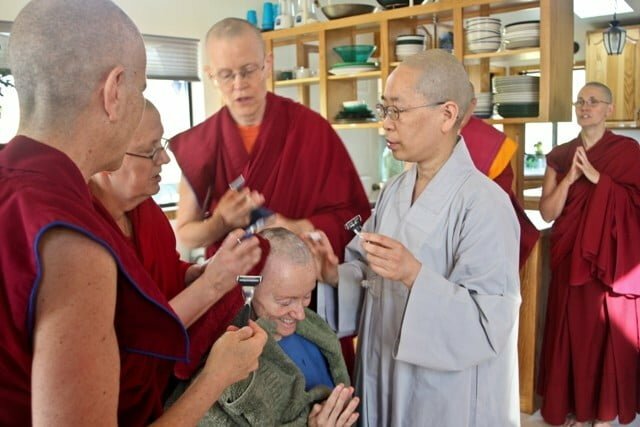 From the side of the Buddhas and bodhisattvas, they don’t need us to bow or make offerings to them, but from our side, doing these activities helps develop humility, respect, and generosity. 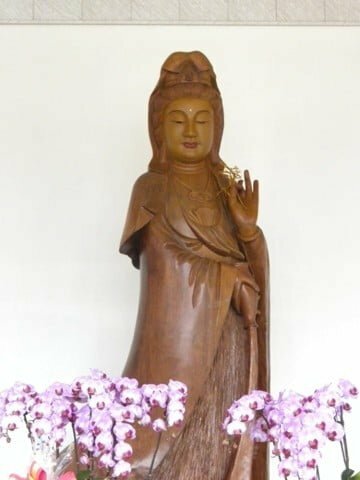 Statues and paintings of the holy beings help us remember their kindness in teaching us the Dharma and guiding us on the path. Recently the Abbey community filled and consecrated a number of statues that have been given to us, along with statues from friends who asked us to fill and consecrate them.